Wheelchairs’ number one enemy is stairs, and whether you are someone who uses a wheelchair or a caregiver, you know the frustration that sets in when you don’t have access somewhere because there is no ramp. If you or a loved one is a senior who is looking to age in place, you’ll need threshold ramps to ensure mobility throughout the home. There are also portable threshold ramps on the market for seniors on the go who can experience of going wherever they’d like after putting down a convenient, portable threshold ramp. Regardless of your unique situation or needs, there are wheelchair threshold ramps available for every situation. Our goal is to help you maintain your independence and maintain a high quality of life. If you feel like a threshold or doorway ramp is something that could be beneficial to you, keep reading. This wheelchair ramp for doorway is a simple but effective option for most situations. It is versatile enough to fit any doorway and accommodate any wheelchair. This threshold ramp for wheelchairs is simple but exactly what you need to get through a doorway with little difficulty. The threshold ramp fits nicely in place and does not require any anchoring, so it can be set in place with little physical effort. The maximum rise for the ramp is ½” – ¾” for wheelchairs and it has a 600-pound capacity. The ramp also comes with a limited lifetime warranty covering most wear and tear issues. We see little issue with this threshold ramp other than it is not easily anchored if you do have a larger threshold that you need to accommodate. This is a high density foam ramp that has a polyurethane coating. It fits 4” thresholds and is lightweight and easy to move from place to place. This is an excellent choice if you are looking for a threshold ramp at a fixed height. This one is a high-density foam, so it does not sink or give way when you step on it, like regular foam. It’s an excellent option for indoor or outdoor use because it won’t scratch any surface that you put it on. On the exterior of the foam is a hard polyurethane coating that is rough enough to prevent the ramp from sliding around and becoming slippery, but not so rough that someone couldn’t walk over it in bare feet. 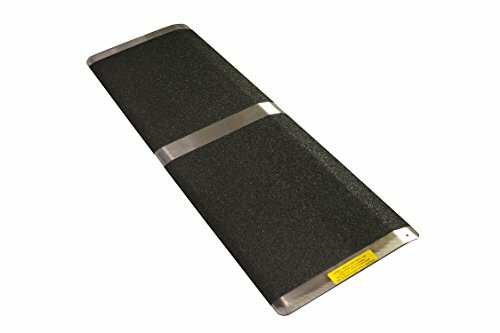 This threshold ramp for wheelchairs is also lightweight and easy to move around so it can be stored away when you do not need it and quickly brought back out and installed when the time comes. This option could be the best for intermittent use, such as if you are a caregiver bringing a loved one to your home for a limited time, or if you are a senior with a temporary injury or recovery period. This heavy duty ramp weighs 30 pounds and can handle a total weight of 40,000 pounds to accommodate heavier wheelchairs and the need for durability. 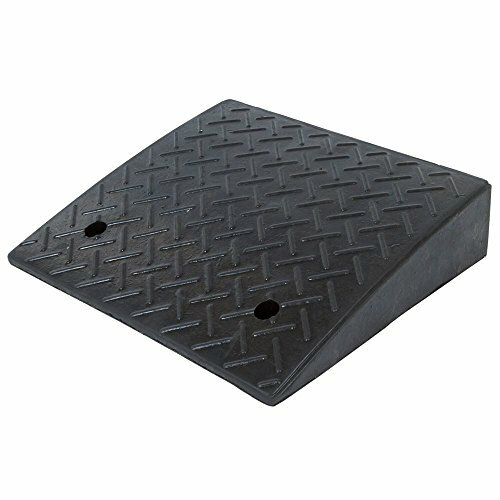 This heavy duty ramp is made from a high-density rubber and can be used both indoors or outdoors. It has two holes in the front that you could use to anchor the ramp to a location permanently. We recommend this ramp for a highly trafficked area where you know you’ll be using it for a long time to come, such as a front door or garage door. For seniors aging in place, this ramp is offered at a great price to install and know you won’t have to worry about it for a long time. The ramp is specifically designed for traction, so it’s also a great option for outdoor use. Each ramp weighs 30 pounds and sits at approximately 4.25 inches. To give you an idea of how durable these ramps are, you could drive a full-size SUV over them. 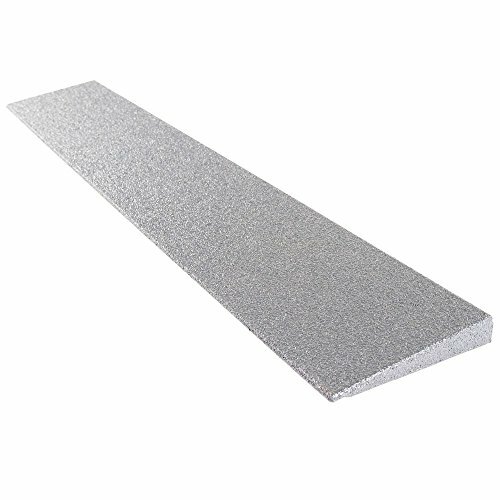 We like this aluminum ramp because it will not rust and is great for outdoor use. This non-rusting aluminum doorway ramp creates an easy transition through doorways and over small steps. The ramp is primarily used outdoors and has a maximum capacity of 600 pounds. With this ramp, the first three inches of slope come fully assembled, and you are required to add the last inch of the ramp so that it hangs over the threshold where you are applying it. If you do not add that last section, the ramp could serve as a smaller three-inch ramp. If you add the extra part, it will work as a four-inch ramp, so this gives you a bit of versatility with where it can be placed. While this ramp works well, the slope is more steep than others. This could pose difficulties for seniors who use manual wheelchairs and also do not have the motor skills necessary for a heavier push. However, it is a great option to use for your front door if it has a higher threshold, especially since the aluminum materials means it won’t rust outside and can be used for a long time. 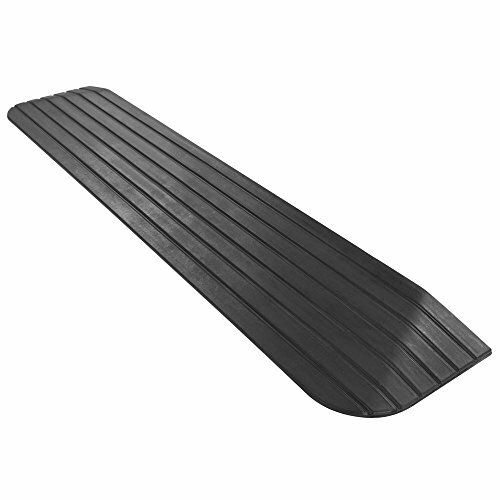 This rubber threshold ramp is an excellent option for small door jambs because it comes in one piece and has non-slip grips on it. It can be used both indoors and outdoors. 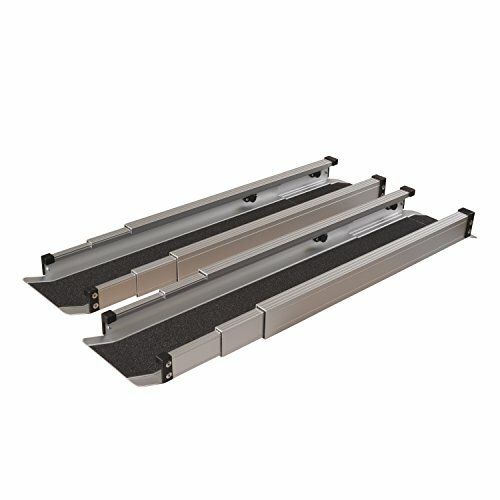 The Silver Springs Rubber Threshold Ramp is perfect for door thresholds in a variation of sizes. You can get this ramp in heights ranging from 1 inch to 2 ½ inches. It’s made from recycled rubber and has a weight capacity of 1,500 pounds. This ramp is not for steps, but it is more for your a door threshold. This is a great option for getting between a patio deck and a sliding door, or a similar area that has a small threshold. It has beveled edges, so if your wheelchair is a bit oversized or you try to come through the threshold at an angle, you can still make your way in. A lot of rubber ramps can get slippery, but this one is fitted with slip-resistant channels that help you get better traction if it is wet. This makes it a great option to use outdoors. This ramp also comes all in one piece and requires no assembly. It is a bit pricey for being a smaller ramp, but it’s a great option if you have smaller thresholds throughout the house or need something that you can put in place on your own. We love this portable ramp because it folds in half and comes with a handle for easy transport. This ramp is incredibly sturdy and portable so you can transport it around as you need it. It folds in half and also has a handle attached to it for easy carrying. At the top of the ramp where it meets the step, it has a grip area so you can fit it up against a step to prevent sliding while someone is coming up on a wheelchair. The ramp also comes with grips on the bottom to make sure it does not slide out from the step, but it may not be sturdy enough to accommodate heavier wheelchairs. The manufacturer says this doorway ramp works for one or two steps, but we would not recommend using it for more than one. It already features a steep incline, and two steps might increase the difficulty in getting up the ramp with a wheelchair. We do like the fact that it has rollover stops on the sides for added safety. The surface of the ramp has anti-slip skid-resistant tape, and the ramp has a maximum capacity of 800 pounds. This ramp may not be the best option to use throughout your home on a permanent basis, but it’s the best option if you’re on the go and need to ensure you can enter any building or area that might include a step. If you’re a senior who travels with a caregiver, they can easily fold the ramp up and bring it wherever you’re headed. We love this portable ramp because it folds in half and comes with a handle for easy transport. It does have a habit of slipping off the step though so you would want to reinforce the grip. This is a unique design for a wheelchair ramp that’s both safe and adjustable. The way this ramp works is you have to line up the two rails accordingly, and they are entirely adjustable to meet the needs of a variety of differently sized steps. According to the manufacturer, these are long enough to span as much as four steps with a range of three feet or as long as five feet. The inside track of the ramp is four inches to accommodate most wheelchair wheels. However, the tracks may not be wide enough for all wheels, especially those that are not lined up entirely straight. Because the tracks are raised on each side, they promote safety and can prevent any accidents where a wheelchair might slip off of the side. This ramp comes with its own carrying case, so it’s also a great option for seniors who might travel a lot and need to be able to easily carry around a ramp for a variety of different size stairs. The polyurethane coating on the outside is rough enough for you to grip it with a wheelchair when you go over but it will not damage or scuff the floor in your home. 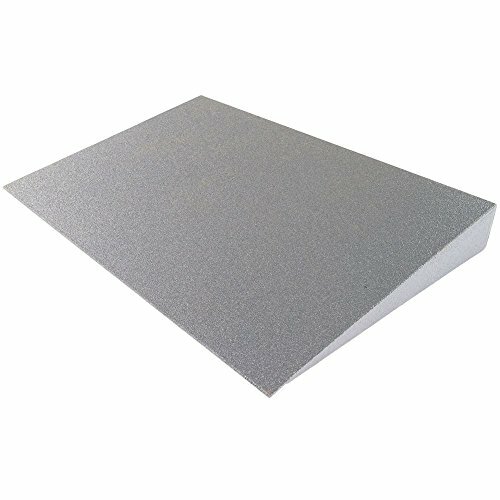 This indoor ramp is a high-density foam similar to some of the others we have reviewed. It only spans a one-inch threshold, which why we chose it for a great indoor ramp. The polyurethane coating on the outside is rough enough for you to grip it with a wheelchair when you go over but it will not damage or scuff the floor in your home. The material also makes it easy to move around, so especially if you are temporarily in a wheelchair, it can be placed wherever you need it the most. While you cannot permanently attach this ramp to the floor in any way, it does not slide around, which ensures the safety of the senior who is using it. This beveled outdoor ramp is an excellent option for entering and exiting your home without having to jump the wheelchair over the door jamb. This works excellent for screened patio doors and sliding doors. Made in the USA of recycled rubber that is durable and slip resistant by nature. The portable mat can easily be moved to another door or location. This beveled outdoor ramp is an excellent option for transferring into your home without having to jump the wheelchair over a door jamb. This works excellent for screened patio doors and sliding doors. The ramp is made of a beveled rubber that spans a 1.5-inch gap and weighs 14 pounds. There is no assembly required because the ramp comes in one solid piece and it serves its purpose as expected. This ramp is best for manual or lightweight wheelchairs as the material is not thick enough to support heavy weights. However, because of the lightweight rubber material it can be easier to move around outdoors versus a thick aluminum ramp. Not all ramps fit every doorway, so you want to make sure you get the right ramp to fit your specific needs. Not all wheelchair ramps fit every doorway, so before purchasing you’ll want to make sure you get the right ramp for your situation. Above, we reviewed several different kinds of threshold ramps, each with their own purpose. Since each ramp comes with its own features and specifications, we want to help guide you through making an informed purchase that fits your specific needs. Rubber door jamb ramps are meant to get you over a slight lip in a doorway. These are common for doors that slide, such as patio doors. If you have a rubber ramp on each side, you can navigate over the door jamb without having to put extra effort into getting your wheelchair over the threshold. The rubber materials is also designed to be slip-resistant, making these a great option for outdoor use. These would also work nicely if you have trouble getting in between doorways due to a slight lip in the flooring. It would make a smooth transition from room to room and allow the user to wheel themselves through without requiring any help. Caregivers might find these a great option for seniors aging in place in their own home, so they can be left to navigate the home without any worry. These ramps are made specifically for outdoor use. 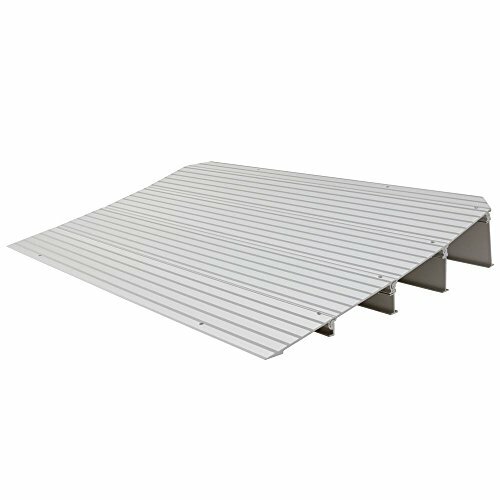 Aluminum ramps do not rust and can be used to navigate up one or even two stairs if necessary. These often have rubber tape on them to prevent slipping and padding underneath, so the ramp will not slide off the stairs regardless of the incline. The best way to use aluminum ramps is to anchor them into the stair permanently, but they can also often be used portably so you can take them with you and use them whenever you need to. 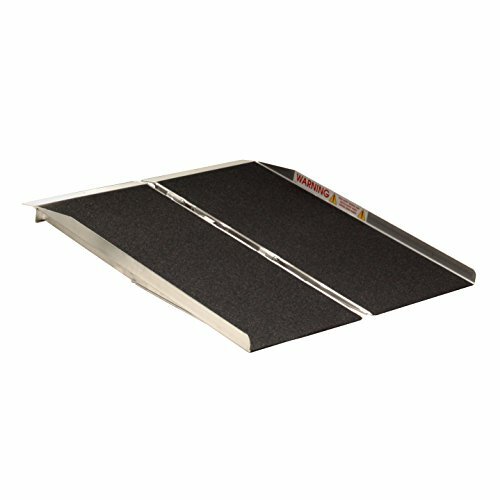 These ramps are similar to the rubber ramps in that they’re optimal for at-home use with limited set up. You can find them ranging in height from one inch to four inches, and they have a polyurethane coating on the outside that makes them slip resistant. This type of ramp is ideal for indoor use because they are not that much of an eyesore and they could help the wheelchair user get up an entire step if that is necessary for the home. There is no way of permanently anchoring these to the floor, so you have to be aware of that, but the coating on the outside prevents them from slipping around too much. Because they’re more lightweight than other ramps and aren’t permanently anchored, they’re a great option for seniors who might be temporarily using a wheelchair or aren’t using their wheelchair all day long. These seniors will be able to easily move the ramp around as needed. Compared to portable rubber ramps, these ramps are what you typically see at car dealerships and other places where people need to move vehicles up into things. These are heavy and often have handles on them so you can carry them without struggling with the weight. These rubber ramps hold a lot of weight, usually in the tons, and have the versatility to be used in a variety of situations. Though a bit pricier, we would recommend these ramps to be used for seniors who know where they will be aging in place for an extended period of time and need an easy wheelchair solution that they don’t need to worry about once it is installed. These ramps can be anchored on front doors and entryways and left to withstand high amounts of weight and use. Many seniors who are aging in place will need to consider their mobility and how easy it will be to move around the home they’ve chosen to age inside. When wheelchairs are involved, it’s fairly easy to fit a home with the appropriate threshold ramps that will take you from point A to point B without difficulty or danger. Whether you’re permanently in a wheelchair, temporarily using one, or if you’re a loved one who would like to have options for a visiting seniors, there are threshold ramps available for every scenario. Keep your needs and budget in mind, and you’ll be able to find the best ramp that requires the least difficulty to install and maintain.